Run by marine biologists, AuthorityAquarium is a comprehensive guide for fish-keeping enthusiasts. 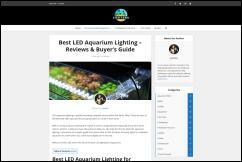 We provide everything from filter reviews, aquarium guides, to LED aquarium lighting tips. FishTankSetups.com provides those in the fishkeeper hobby reviews and information on the best aquarium lighting, substrate, filters, and other fish tank related topics. An excellent saltwater and tropical fish website that covers saltwater fish, freshwater fish, invertebrates, fish health and disease treatment, and aquarium maintenance. We help you to choose the right equipment for your fish tank by creating original reviews. We provide everything from water filter, water pump, canister, protein skimmers, lighting, etc. Which Fish Tank.com offers impartial advice and knowledge for anyone who is buying and setting up their first marine or freshwater fish tank / aquarium. Where fish keeping comes alive! Slypets.com is the top source for fish and aquarium. Our goal: To provide everything from filter reviews, aquarium guides, to LED aquarium lighting tips. Aquaticsworld.co.uk Fish Tank Reviews and Guides For Cold and Tropical Aquariums. Love Fish Tank is a website about fish tank supplies and aquarium fish care. FishTankWorld.com commitment is to spread knowledge about fish keeping and help aquarist hobbyists with easy, actionable information to help them take better care of their fishes. The site contains info on setting up and keeping your aquarium, fish and plants, fish tanks and the equipment necessary to run your aquarium. Aquariphiles is a hobby site about aquariums and fish keeping in general. The site contains sections on different aspects of fishkeeping, rehoming, fish articles and new sections are being added regularly. We provide information about aquariums, ponds, fish and how to keep and breed them. Providing the best information, knowledge and guides about all topics related to freshwater and saltwater fish. Aquarium Chatter features saltwater, freshwater and reef aquarium information. Additional topics include fish breeding and other various aquarium projects. FishTankSetups.com provides product reviews and guides for setting up an aquarium. Offers aquarists a variety of information on keeping freshwater tropical fish, as well as DIY projects and other information for maintaining a healthy aquarium. One of the oldest aquarium sites on the Web. Badman's has articles about tropical fish, a forum, DIY projects, aquatic diseases, aquatic plants, and more. 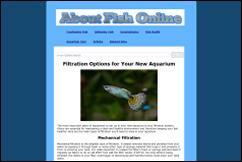 This site provides aquarium tips and information based on over twenty years of experience. The purpose of the site is to help beginning aquarists set up and properly maintain their aquariums. German blog about aquariums and related products with tips and tricks. Has a weekly Internet talk show that gives advice to aquarists. They also have a lot of information on particular fish species and also tips for maintaining a healthy aquarium. 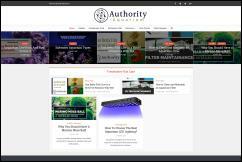 Is a comprehensive resouce for the aquarium hobby. They discuss both freshwater and marine fish species, and invertebrate care. Wet Web Media also publishes the online magazine The Conscientious Aquarist. Pet care tips and pet supplies review website.